Our gamer friends in Saudi Arabia can't buy titles like God of War 2. Not only are they banned for sale within the country, if you order it online you risk having it confiscated, and then you have to pay a fat fine (about $125 US.) No surprise that this kind of crackdown only breeds a black market for the goods in question, and reader Alaa A. shows us how some retailers get around things so he and others can get their Kratos on.Alaa tells us that at Rashid mall in Khobar, he spied Chains of Olympus, the GOW version for the PSP. Wondering if that meant they also had GOW2 he inquired. Lo and behold, they did. And here's the part where I want to imagine Alaa wearing a fedora and the clerk in an eyepatch, with a monkey perched on his shoulder, leading him into an anteroom while looking nervously over his shoulder. The guy handed Alaa a shrink-wrapped copy of Winning Eleven. 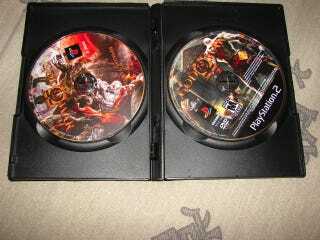 When he opened it, inside was the God of War 2 disc, and the GoW cover neatly slid behind the Winning Eleven artwork. "I got for around $25 and it's an original copy," Alaa said. "Makes me feel dirty for some reason though." Another pic below.